As promised, here is the second installment of the Ohmygod saga for February. I really wanted to end the week in the Loire this month, but a 4000+ word post is in nobody’s interest. Next month, I the plan is to move onto Champagne, after saying goodbye to both Grumpy and Mr. Personality. Don’t worry, Ohmygod is still with us in Champagne along with several new characters. Please let me know what you think so far in the comments section! In the previous installment (Part Eighteen), After a long day’s ride from Tours to Chinon, rolling through Villandry, Langeais, and Azay-le-Rideau, I arrived at the hotel with Grumpy and Mr. Personality to find Ohmygod clad in a completely different “wardrobe”. Clearly, Grumpy had reached his Ohmygod saturation point, but I will admit that he was speaking for all of us (or at least me). It was a stupid statement to make, and I felt like a dork even saying it, but the thought of Ohmygod wearing a tie caused countless images to run through my mind: a paper shredder, Isadora Duncan, and of course candles. There were countless reasons why he should not wear a tie and I could not think of one why he should. Since it was already near 7:00 and neither of them had showered, Grumpy and Mr. Personality quickly agreed and headed off to their room. Ohmygod, on the other hand looked a bit confused, even angry. Just before he could open his mouth to complain, I held up my hand as if to tell him not to speak. I then reached into my fanny pack (yes, when in Europe, I use a fanny pack/money belt to carry my money and identification with me wherever I go, judge if you must) and pulled out ten Euros and handed it to him. At the mere mention of “beer” his demeanor changed completely–it was as if I had just handed him his lost puppy, gave him a winning lottery ticket, or told him that his mother would be joining us for dinner. He looked at me for about 17 seconds, apparently to determine if I were indeed serious, then picked up the half-full beer that he had been drinking and finished it without swallowing. If there were two “talents” at which Ohmygod truly excelled (other than repelling all animals–insects, dogs, cats, humans) it had to be chugging beer. The latter invariably followed the former by no more than a second or two. He then paused again, looking at me one more time to see if I had changed my mind, grabbed the ten Euros, and bounded off with his newly acquired riches into town, still dressed in bike tights and a ratty t-shirt. I did not follow him. Instead, I headed to my room, took a quick shower, and walked into town. There was certainly an extra hop in my step since it looked like I was finally going to get a legitimate night off! There is no denying that being a bicycle tour guide in Europe is an incredible “job”–I get to ride my bike through beautiful countryside, visit history, dine royally, and meet wonderful people. There are times, although rare, that I just need some “me” time. I had hoped to get that in Tours, but it was delayed a day. I went to a favorite restaurant of mine in town: La Maison Rouge. 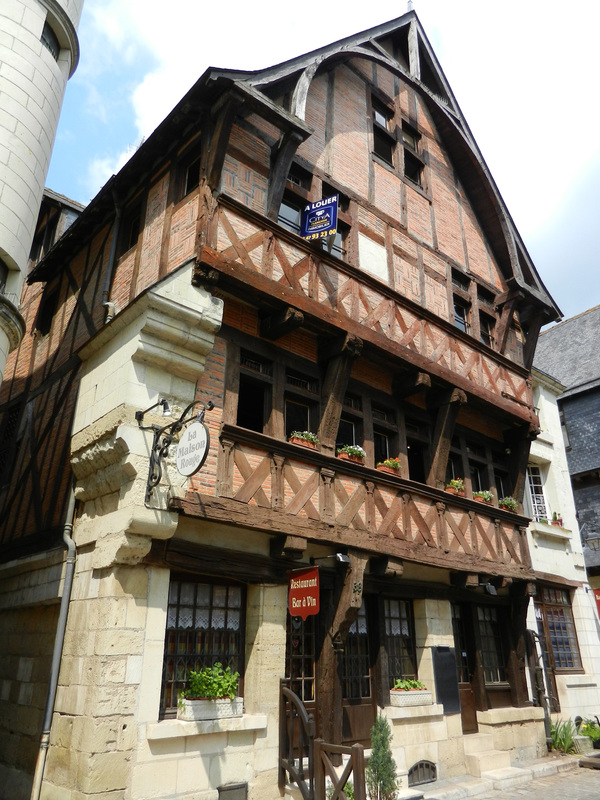 The restaurant is right in the middle of town and the building has been there for over 800 years–Joan of Arc even apparently dined there in 1429. The current iteration specializes in modern interpretations of game meat: venison, pheasant, wild boar (it is a favorite in the area and they claim they are thriving in the Chinon forest, but…). The restaurant has a fantastic list of local wines, which go fabulously with the flavorful dishes. It was also very nice that the owner remembered me from my last trip, and he was eager to show me his new “secret” wine menu. 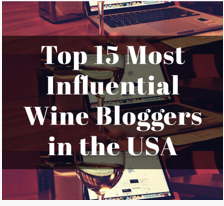 (He knew that I was a bit of a wine hound and was excited to share the list with me.) The night was delightfully uneventful. I opted for a venison sausage plate with a wonderful older vintage of Bernard Baudry’s Chinon La Croix Boissée off the secret menu. The wine was on the verge of magical, and paired perfectly with the venison. So much of the enjoyment of wine is contextual–how could I not enjoy a local Cabernet Franc with a specialty of the region, sitting in the same spot that Joan of Arc sat some 600 years earlier (OK, I had no idea where little Joannie sat, but its my fantasy, so back off). After dinner, I chatted a bit with the owner over a glass of Eau de Vie at the bar. If you have never had Eau de Vie, one word: Don’t. It not only put hair on my chest, it also covered other areas with hair that I will not elaborate upon here. When I pointed out that we were about 200k from the ocean, he just shrugged and hopped on his bike. Yeah, that’s going to go well. As for me, I had a delightful day: I went for a short ride to Bourgeuil and back, and then stopped at Couly-Dutheil for an early afternoon tasting. Couly-Dutheil has been around for only about 80 years, but they own quite a bit of perhaps the most coveted vineyard in Chinon: the Clos de l’Echo, which was once owned by the father of the Renaissance satirist, François Rabelais. Rabelais is believed to have said that a good glass of Chinon wine would do more for you than putting your faith in Catholicism. He was banned from the Church. Sounds like a fun guy. Good enough for me. I spent the rest of the afternoon watching the Tour de France and making a reservation at Les Années 30, a newish restaurant that looked rather enticing. The reservation was for 8:00 and I left a note for the three others at the front desk, indicating such. I made my way down to the lobby around 7:30, and I was quickly joined by Grumpy and Mr. Personality for a Kir. They both had a wonderful day exploring the town, visiting the castle, tasting a bit of wine, not seeing Ohmygod once. Minutes before 8:00, Ohmygod came down stairs and I had to repress the (I am looking for the proper word here) laughter/shock/horror. None of these words really fit. First, since the guy’s short term memory is slightly shorter than a three month old puppy, he was wearing a tie. And oh, what a tie. Maroon polyester with fat turquoise and yellow diagonal stripes. It was tied in such a manner that the “skinny” part of the tie was a full 3 inches below the “fatter” part of the tie. Then there was the shirt: white with blue, green and pink vertical stripes. His pants? A lovely polyester, black and white checked (not quite the type worn by chefs in restaurants, but close). Mr. Personality later confided that he, too, had a very difficult time keeping a straight face. I debated if these “real clothes” were truly better than the cycling gear. I’ll get back to you on that. At dinner (after promptly removing his tie and stuffing it in his pocket), he proceeded to ask me the same question, no fewer than six times: “What are the laws that regulate how long bars can stay open in France?” The first few times, I thought he was simply trying to find out if the bars would be open after dinner, but clearly he was more interested in the actual laws themselves (at least I think that was the issue) I wanted to say “how the hell do I know? I just go to them,” but I was trying to avoid any snarkiness. Once that starts flowing, there is no stopping it. He ordered trout for dinner, I started to warm him that the dish would show up as a whole fish: skin, bones, head still attached, but I was distracted by the large belch that he released immediately after ordering the fish in his own version of French, which this time was a combination of actual French words (spoken with a Spanish accent), English words (spoken with a French Canadian accent) and either Portuguese or Flemmish words thrown in for the ride (I actually have no idea what language those words were, nor with which accent they were actually spoken). When a whole fish arrived, as anticipated, I could sense a collective cringe among the three of us, but I dared not look at either of the other two–they were either about to burst out laughing or preparing to bolt from the table as if it had just caught fire. I had to maintain at least a modicum of composure. To my amazement (as well as to the other half of our quartet), Ohmygod did not bat an eye once the fish was placed in front of him. He calmly grabbed his napkin, placed it in his lap, and picked up his knife and fork. Those simple actions would have been enough to cause my chin to drop to my knees for he had not used a fork at all for the last three days, I had never seen him use a knife, and the stains on the sleeves of his cycling jerseys clearly demonstrated that he had absolutely no use for a napkin. He proceeded to debone the fish with utmost precision as if he were the most skilled fish monger or even a brain surgeon. I was stunned. He maintained the use of his fork for the entirety of the meal, which was a pleasant surprise. When the waiter came to remove his plate, however, he grabbed the fish skin and stuffed the entire thing into his mouth. Let’s just say it was clear that the waiter had never seen that done before. After, while finishing off the last bottle of wine, he engaged in some conversation. He let me know that he did not make it all the way to the ocean, but he did see some châteaux (pronounced shay-TOES). Picking up on a potential cultural moment, I asked him which ones. “That means ‘private castle’.” I said, as I began to uncontrollably shake my head. As promised, there is the second installment of the Ohmygod saga for February. I really wanted to end the week in the Loire this month, but a 4000+ word post is in nobody’s interest. Next month, I the plan is to move onto Champagne, after saying goodbye to both Grumpy and Mr. Personality. Don’t worry, Ohmygod is still with us in Champagne along with several new characters. Please let me know what you think so far in the comments section! This entry was posted in Humor, Ohmygod, Wine and tagged Chinon, Mr. Personality, Ohmygod. Bookmark the permalink. Hahahaha! I went to a party last night and recounted yesterday’s story. This is hysterical!! Thanks so much! Don’t be shy–tell the others at the party to stop by the blog. I won’t mind! Loving this. Will back read. Thanks, be sure to let me know what you think! i look forward to this every month! Just love reading these! Keep them coming. These posts always make me laugh. Great to hear–I’m sure going to try! Hysterical! Can’t wait to catch up on the other posts. Cheers! He will drive even me to drink. I think I like François. Would love to hear those stories! That is…how do you say in French? Hilarious! Thanks! Glad it made you chuckle! Thanks! If you need more chuckling, there are 18 other “chapters”! Hilarious, as always! Love this: “Let’s just say it was clear that the waiter had never seen that done before.” Definitely, keep the installments coming. Who do you think should play Omigod in the movie version, by the way? That is an excellent question. Certainly, Marty Feldman comes to mind, but he might be dead…. It’s a pity he is. Marty Feldman would have been perfect. Got sidetracked and had to search for the second instalment. Thank goodness I did. Priceless. Keep going man. Thanks so much! I will get those linked up….